Eaux de Parfum 15ml are 30% off (aka $84 instead of $120). Did you know that perfume helps with memory retention? To help make your school year begin on the right side and give you that extra brain boost of all-natural scents to remember - we are offering a special 30% discount on our new EDP spray bottles! Join our Facebook fan page to qualify for the discount (details on how to get it are on the FB page). The sale expires September 30th at midnight, so you have just a little over a day to take advantage of it and get your favourite fragrance for $84 instead of $120!!! Rosh Hashana, a photo by Ayala Moriel on Flickr. Wishing you all a sweet, fruitful and beautiful year of health and happiness. 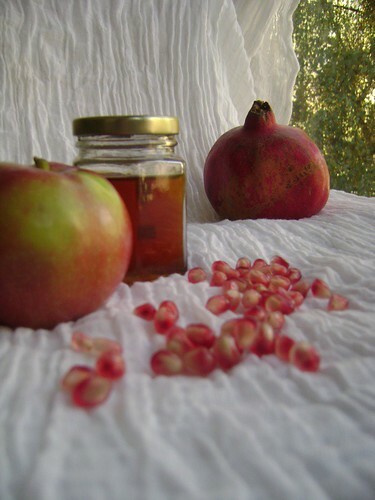 Shana Tova u Metuka! Nicola Twilley at Gel 2011 from Gel Conference on Vimeo. Nicola Twilley shares the process of how she came up with a smell map of New York City - based on the scent preferences of the people who inhabit it. You must watch all 16:40 minutes of it, it's equally fascinating and nerdy! Zangvil Tea Mystery Ingredient Revealed! The seeds of Abelmoschus moschatus (an evergreen shrub from the hibiscus family, with yellow flowers with purplish-pink centre) are known for being the most similar plant aroma to that of the deer musk! Because of its beautiful, musky odour, floral, wine-like, nutty, reminiscent of overripe fruit or even lychee. It is very rich in ambrettolide, which smells like what we learned to call "white musk" (yup, the one by The Body Shop!). 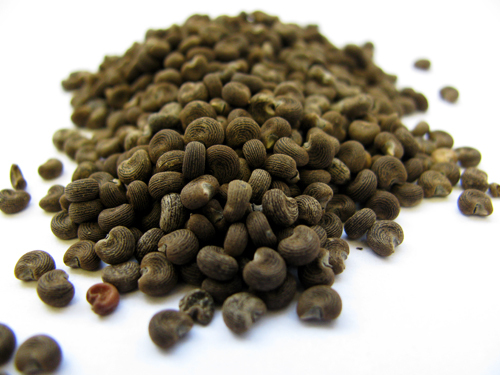 Ambrette seed is considered an aphrodisiac. It is also used as spice in the East, and is used by Arabs to flavour coffee (much like they do with cardamom seeds). The tincture is used to flavour tobacco as well as liquors. Ambrette also has medicinal benefits (mostly used to ease indigestion, cramps and nervous dyspepsia. Zangvil tea can be re-steeped as many as 6-7 times, with the woodsy, musky vanillic notes of the hand-sliced vanilla beans and aromatic ambrette seeds and hints of spicy sweetness from the organic candied ginger lingering on and on even beyond the tea leaves themselves (which still emit their subtle, peachy-jasminey aroma till the 4th steeping). Congratulations to ahsu for guessing correctly (the 2nd time around...). You will be receiving a 50gr tin of Zangvil tea (value of $30), which will be sent to you when Zangvil perfume & tea are launching - 20.11.2011. Until than, you can pre-order it online! Read my interview for Inside Vancouver - I'm this week's featured Vancouverite! 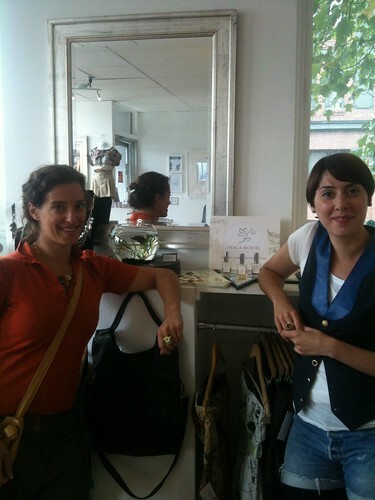 Ayala Moriel Parfums are featured in Paige Padgett's blog post Cosmetic Chem 101: Fragrance. Paige Padgett is a Green Beauty Expert, makeup artist, blogger and educator. She is also Jillian Michael's personal makeup artist and posts regularly on her website giving green beauty tips and advice. Chypre perfumes originated in the island of Cyprus, and were based on labdanum as the most significant and characteristic ingredient. The island is where the remnants of the most ancient perfume factory was found, where local plants such as labdanum, bay laurel, anise, coriander, sage, pine, parsley, almond, bergamot and others were infused into olive oil and distilled to produce perfumes that were supplied to the royalty, nobles and the wealthy in the ancient world (Egypt, Persia and Rome) until 1850, where it was ruined in an earthquake. The first Chypre "perfumes" in Europe were Oyselets de Chypre - fragrant pastilles molded in the shape of little birds used as potpourri or fumagating pastilles. The first formulations were made of labdanum resin, styrax and calamus (sweet flag) ground and made into a paste with gum tragacanth and than could be sculpted or moulded. They became popular in Europe after the crusaders arrived in the island of Cyprus (in the 12th century). At the end of the 14th Century Eau de Chypre, the Chypre scent (based primarily on labdanum, and only later on oakmoss was added) became quite popular in Europe. At this point oakmoss was added - some formulas were simple, containing white moss and animal materials such as musk, ambergris and civet; some were more sophisticated and called for oakmoss, orange blossom, benzoin, styrax, civet, almond, cardamom, rose, clovewood, sandalwood and camphor. Europe post WWII was swiped by a surge of optimism and renewal with Christian Dior's "New Look" that had its iconic fragrance parallel with the sensual yet fresh green notes in Miss Dior (Originally created by master perfumer and author Jean Carle, only to be later reformulated more times than can be counted... The green notes must have been subcontiously craved because of a need for renewal after the traumas of the war. The 1980's and 1990's marked the beginning of significant reformulations of some of the classic chypres, most likely because of an attempt to make them more appealing to larger audiences and "update" them. The early millennium also marked the growing threat on the core natural ingredients that are required for composing the classical Chypres; and the influence of regulatory bodies in Europe and the tightening restrictions of IFRA (the perfume industry's self-regulatory body), resulting in the rise of a new genre of faux chypres that I call "pink chypres". These oakmoss-less fragrances rely on synthetic musks and dry woodsy notes (synthetic or low-cost naturals such as vetiver, cedarwood and patchouli) to create an unsweet effect as a counter-balance to the many heavily gourmand and stickily sweet fruity florals of that decade. These scents were to appeal to a similar consumer group that would have picked classical Chypres if it weren't for the strict regulations. The fact that these new so-called Chypres are relying on synthetic and cheap naturals that are considered "safe" for now in regulatory terms only serves as a proof that this genre is the child of both political and economical circumstances and is the industry's way of directing consumers to buy what they want to make, while constantly butchering classic formulas of yesteryear (often to the point of no recognition). Oakmoss levels being reduced to 0.1% in IFRA's (latest but not last...) 43rd amendment, and the atranol removed to meet regulatory requirements in all oakmoss extracts produced for the fragrance industry today have changed the character of Chypres all around. 2007 31 Rue Cambon (Chanel) - Jacques Polge - an oakmossless Chypre with an accord of iris and pepper that supposed to substitute for its dry and woodsy character. In summary, strangely enough, Chypre is going a full circle - from being based on labdanum as the primary ingredient, to oakmoss being a must in the formulas, and now when this is becoming less and less possible (if wanting to comply with IFRA) - it is being omitted altogether from the modern incarnation of this fragrance family. Yesterday I've decided on the final formula for my Zangvil perfumed tea blend, and did the first trial scale-up. And of course, now comes the less fun aspect of the process - which is pricing the tea and doing all the necessary calculations, not to mention label design. Each tin, as it turnes out, contains 2 full-length vanilla beans, and the white tea itself is on the pricier side - so the tea is not going to be cheap to produce, that's for sure... However, the good news is, that this tea can be resteeped up to 6 times with a very beautiful, fragrant results all the way till the 6th steeping. 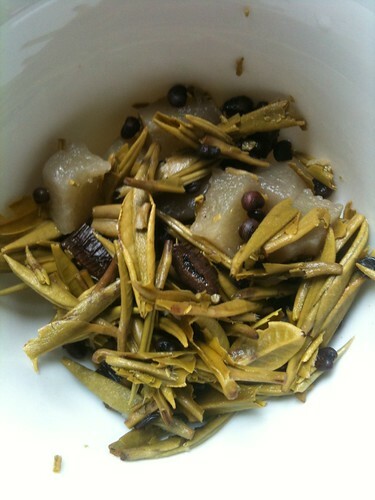 Very unusual for such a delicate tea, but it has a lot to do with the other ingredients there too. The new line of teas (as some of you may have already gathered from the pages of this blog, I'm re-doing all of my tea collection, and they will all re-launch in larger, 50gr tins, as they become ready). New labels are necessary as well, because not only will the list of ingredients will change, but also the size and shape of the tins. And while I'm at it - I'm thinking that little splashes of colours would be nice, similarly to what my amazing graphic designers have done for the scented chocolate bars. I'm thoroughly enjoying the process of creating the new perfumed teas, so it will take a while before the other teas (Roses et Chocolat, Immortelle l'Amour) will be ready. Charisma formula is ready (it all began as a house blend I made for studio guests), so it's just a matter of sourcing the materials myself. It is such an interesting medium to create in, and testing it is very different from testing perfumes - it requires brewing many pots of tea in the right temperature, analyzing the aroma and flavour, and seeing how many steepings can be achieved with each blend. So it's giving me many excuses for throwing little spontaneous tea parties for family and friends and get their opinions and observe their response to the tea, which is lots of fun on its own. Also, each material having a different colour, shape and texture that is visible even more than with the essences I work with for my perfumes. The visual and tactile aspect is a lot more obvious than with liquid essences. 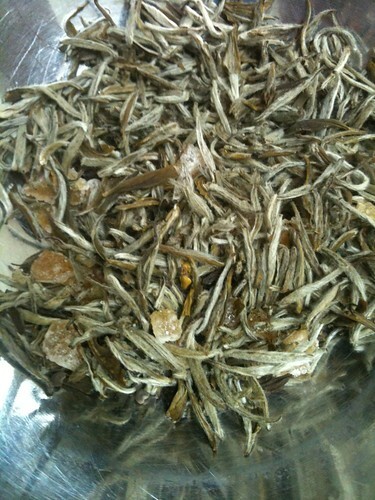 The fuzziness of the silver hairs on the white tea leaves and buds. Yellow jasmine flowers. 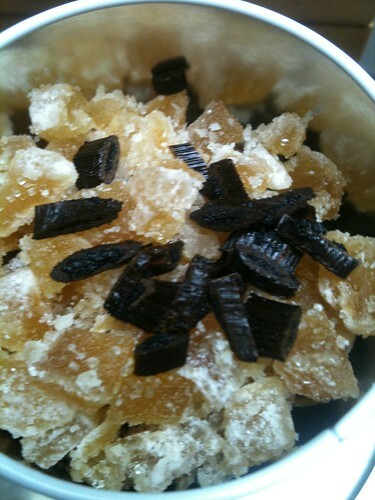 Crystallized ginger looking like chunky gemstones. Long and plump vanilla beans, which I slice by hand, a process that inevitably squeezes out the black seeds from within, leaving their fragrant specs on my fingers and having a rich woody aroma. And the surprise ingredient - are you ready yet? Hmm... I think I will leave this as a secret and will run a contest instead for the person who guesses it! 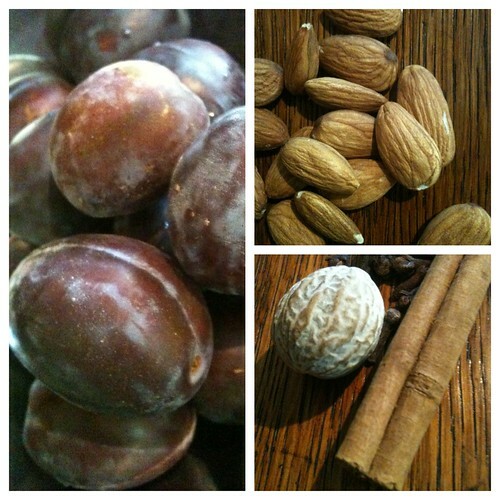 It adds a very luxurious and special effect in the perfume and is totally unexpected - a little nutty and very sweet and soft... Look at the picture and let's see who might be able to guess! The person who does, will receive the 1st tin of Zangvil Tea when it launches November 20th. Harvest season is fast approaching, bringing forward some of my favourite fruit and the funnest thing to do on less than perfect weather days - baking! 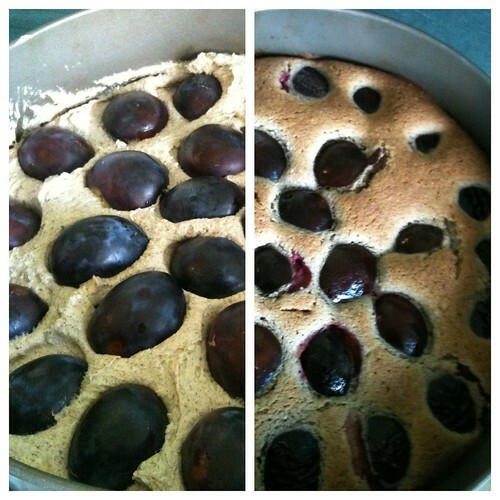 The Italian plum cake recipe I'm about to share with you is a spin-off the apricot almond cake I've been baking at least once (if not twice!) a week ever since apricots decided to ripen. Only in this one is gluten free and warmed up with some spices. The plums you should use are the Italian plums, aka blue plums or prune plums. These and sugar plums are the only plums you can split open and pit without squeezing their juice out recklessly... These plums always appear dusty when picked up fresh from the tree, and that dust gives their naturally purple skin a surreal blue hue. The dust or powder is, in fact, natural fruit enzymes that assist in digesting them. Therefore, I don't even bother with washing them, but I'll leave that decision up to you. I've also added some spices, and of course you can feel free to leave them out if you are not into these spices, or come up with your own spice combination you like for these special plums. The almonds this time are unblanched. So grind up some whole or sliced almonds in a coffee grinder for this recipe. It will give the cake a nicer flavour. I find that sliced almonds have a fair amount of bitter almonds among them, which make their flavour even more perfect for the cake (in which case, you may not need any bitter almond extract at all!). My first time I made it with cinnamon, cloves, allspice and nutmeg, which is the typical Eastern European pairing with prunes as in Povidl (prune plum butter). The 2nd time around I've decided to experiment with black cardamom - my newly found farouvite spice. I'm pleased to announce that the results were phenomenal! - Whip butter and sugar with a blender. - Add the eggs, vanilla, almond extract and spices. Best served warm and fresh out of the oven; or wait till the next day - it actually becomes moister the next day! Best to keep in room temperature, so if you don't anticipate eating it within 3 days and you live in a hot climate, by all means refrigerate it and bring to room temperature before serving. This time, I wanted to try a fresh sample of Pai Mu Tan (White Peony Tea) along with the exquisite, or shall I say - sensational - silver needle jasmine tea I used for all my recent Zangvil tea experiments. 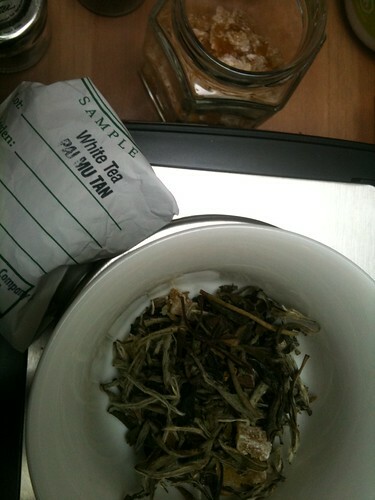 My first tea blend for this concept relied entirely on white peony. It was a little peppery, and surprisingly strong. I wanted this tea to be a little more delicate, so I used only little of the white peony tea (only about 10th of the entire formula). It added a slightly grassy notes that I did not care for, and so I decided to stick with only one type of tea for my tea, which is special on its own, and lends an extraordinary quality to the tea, with the jasmine harmonizing really beautifully all the other elements - even if it's not too obviously noticeable. 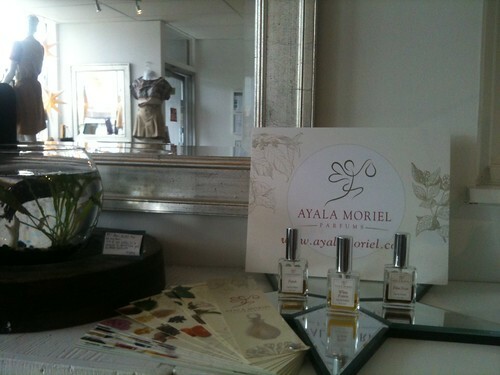 Ayala Moriel Parfums @ Adhesif Boutique on Main! My perfumes launched at Adhesif Boutique yesterday (September 13th)! Get a whiff of my most daring perfumes and discover this whimsical little gem of timeless and bohemian pieces, ethically and locally made. Adhesif Clothing Boutique is located on 2202 Main & 6th Ave. Melissa Ferreira, the owner, is a talented Vancouver fashion designer that creates one of a kind pieces from recycled vintage fabrics for her Adhesif Clothing line, which was featured in Eco Fashion Week, CircleCraft show and numerous fashion magazines (scroll to the bottom of this post to see some self-portraits of me wearing some of the pieces from her recent FW2011/2012 collection). White Potion - seductive & voluptuous tuberose perfume with a creamy sandalwood & tonka notes. 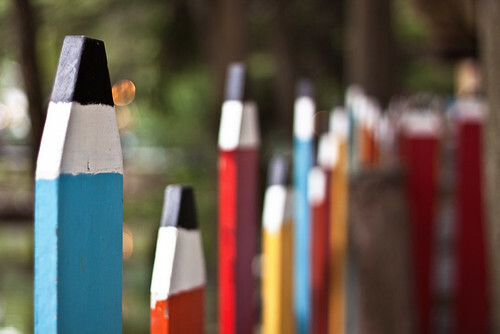 All of Melissa's designs are one of a kind. I'm wearing here the Oh Jackie Jacket (described as what Jackie O would be wearing to Woodstock!) 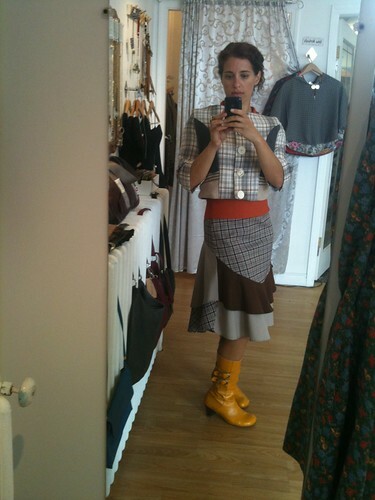 and the Saddle Skirt - the very same one the model is wearing in Adhesif FW11/12 Catalog (sorry, ladies, it is mine now!). Margi MacDonald reviews my Charisma perfume on Perfume Pharmer. Leave a comment there and enter to win a Charisma sample! Facebook Fan Page Promotion this Weekend! Become a fan of Ayala Moriel Parfums on Facebook and learn about our special promotion this weekend to receive a gift with purchase when ordering online! 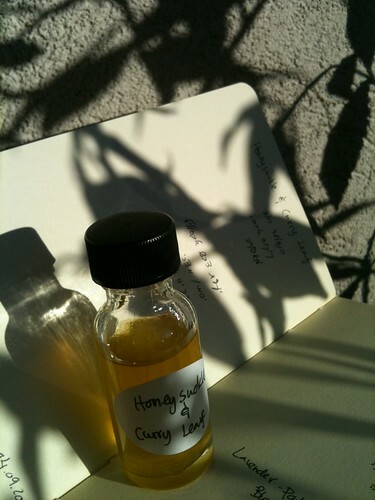 Testing my Honeysuckle & Curry Leaf perfume this morning, and filtering the remainder of the previous batch of Fetish (getting it ready for Adhesif - a new boutique on Main street! My perfumes will be there beginning Tuesday!!!) got me thinking of more leaves that need to be included in this perfume. Kaffir lime leaves and rhododendron buds, to be exact. Hmm... perhaps even some hemp! I returned to the trial vat a few moments ago, adding a little bit of this and that, while being very cautious about not putting too much kaffir lime - I added very tiny bit of my hand crafted tincture of the leaves. It adds a bit of a clean, fresh bite to the perfume that is similar to what a fresh curry leaf will do if you were to bite into it - which I did when I had that amazing dessert at Dosa! The curry leaf was a freshly crystallized one, and was pretty and crisp and odd biting into, crunching the leaf and releasing the aroma in my mouth, along with slightly gritty sugar... Really quite the culinary experience! At this point, the perfume is still a tad too heavy and dense because of the honeysuckle absolute, and not quite as brisk and fresh as the fresh flower is. There might not be escaping the use of jasmine in there after all to lighten things up a bit... But how do you make honeysuckle smell more sweet? And honeyed? This will have to wait for the next post. We have a winner for the Orcas giveaway on ScentHive. Congrats to Bellatrix! Thank you for everyone for your gracious comments. I'm so happy to have such wonderful customers and supporters of my olfactory art, and am glad that the review of Orcas has peaked the interest of those of you who haven't tried my perfumes quite yet. Spent the majority of the day in the water with my daughter making the most of the very last day of her summer holiday. We went kayaking in Deep Cove for the 1st time together (she got some practice in her summer camp and seems to like it!) and than went for a cherry picnic in Deep Cove's beautiful and quiet little beach. Followed, of course, by a swim in the cool water noon water (the tide was coming in). I noticed many moon jellies in the water earlier as we were kayaking - it was hard to tell if they were alive or dead, since they looked mostly passive and nearly floated above the water surface. I did not expect to see them closer to the shore - and so many of them. I asked a lady on the beach if they sting, and she said they do; however, while knocking into tiny or bigger ones was inevitable for a swimmer with so many of them in the water, I did not feel any stinging so I just kept on going... Coming out of the cove, once my skin dried in the hot noon sun, I couldn't help but notice that my skin smelled a little like clay... Which is how slimy and slippery the cove's floor is. There's a dock/diving board in Deep Cove's beach, and there were three kids playing on it. At first I didn't want to interfere with their play, so I kept swimming way past it. But when they were still there when I returned, I figured that I might as well climb on the dock and enjoy the sun for a bit. As long as you don't try to hard to pretend like you're an adult around kids, they usually won't mind a grown-up being next to them... And if anything, you'll learn a thing or two that you didn't know before. They were lying on the dock facing the water, and talking about crabs... Well, the water in Deep Cove is clear enough that you can see the crabs crawling underneath the water from some 3-4m waters... It was crawling sideways as it should... And they were also catching moon jellies and watching them melt in the sun (it does not take very long...). 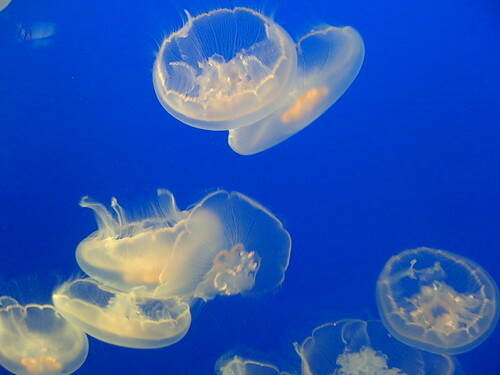 They also told me that the moon jellies don't sting, which turns out to be true. Only the big purple jelly fish here are of the stinging kind. While packing orders this afternoon in between beach hopping, a courier stopped by with a giant box reeking of a tea shop aroma... It was no other than the samples of the new tins I'm planning to use when the new teas are ready this fall; plus about 50(!) samples of teas that I've never asked for. Some of them might be useful (lapsang suchong, white tea, organic assam and darjeeling), but most of them are just fun fruity flavours of aromatized teas that would probably end up as gifts in my private tea parties in October and to friends who enjoy fruity aromatized teas. The day went along quite uneventful - went to the post office to ship orders in the afternoon, stopped at the health food store for some school snacks and got revolted by freshly bound smudging wands of cedar and sage - the aroma is so potent it was sickening to be around it... Yet, I'm somehow haunted by it and if I know myself at all, I will be at that shop again tomorrow sniffing that disturbing, medicinal-bordering-on-the-toxic aroma. Waking up early this morning, I thought it was going to be an overcast day. It really just was too early for the sun to rise (it's getting a little lazy recently with the Autumnal Equinox approaching...). I was in the perfect mood for trying out this perfume idea I had that is definitely more of a colder weather fragrance: Incense and chocolate. The combination came out of two things I often turn to for comfort and what I'd like to think of as grounding myself, but might seem indulgent to others - savouring a square of SeaNymph's chocolate bar (with crushed pieces of her salted English Taffee) while burning incense... I try to do both (not necessarily simultaneously...) on a daily basis (do I need to explain why?!). There is no shortage of chocolatey perfumes in my collection, but then, people's love for chocolate in all forms seems to be never quite satisfied enough. But still, I'm trying to get somewhere different with this one. 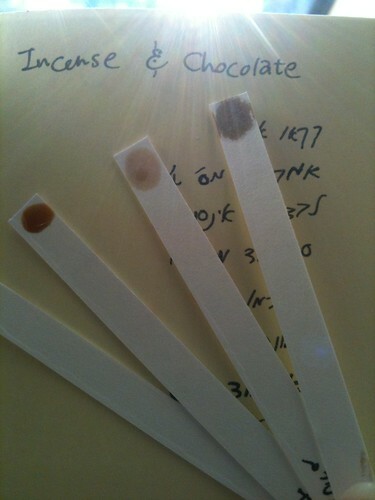 And incense and chocolate is just the starting point... And it lead me to new ideas altogether to marry with chocolate, for example - frankincense, which I was really afraid of adding to the cocoa absolute at first. I'm still not convinced it's the right thing to do, but judging by how wonderfully it wore on my skin throughout the day, I'm not ruling out just yet. And of course I was wearing it - for the duration of what turned out to be the hottest day of the year... And also one of the best of them too! 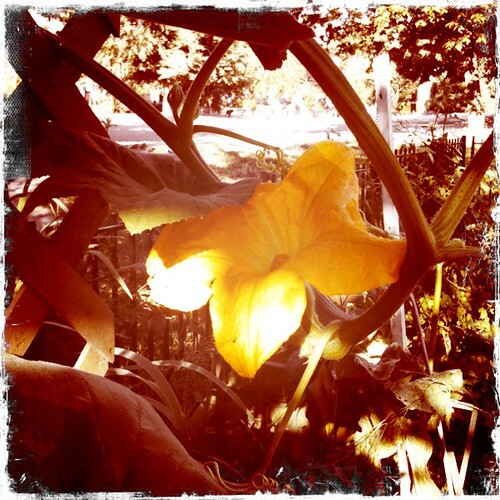 About an hour later, the sun rose, bright and beautiful, and I went for a little walk - first to witness a red robin bathing in the pond in the courtyard behind my house; then to see pumpkins in the making at the community gardens on Nelson Park... And when I came back, there was a delicious breakfast that my brother cooked for us. I took my daughter to the PNE for the first time and we watched a horse show and hang around till we got too tired and hot... Then went back home only to pack a picnic of watermelon and feta cheese (you should try it sometime!) and head to Sunset Beach. And there were a couple that were letting people try the stand-up paddle boards they are selling, so I got to try that for the 1st (and 2nd!) time, not to mention swimming with a seal right in front of me for the only time so far this year (I was swimming towards it and it did not get scared at all, not even when I greeted him "hello seal"). All in all, one of the best days ever! Honeysuckle & Curry Leaf, a photo by Ayala Moriel on Flickr. With the summer holidays coming to an end, it's ironic we're getting such hot summery days at long last... Today was probably the hottest day of the year, actually... But it does start to feel like fall is approaching. And there is no more sleeping in with the new school bus schedule, so I was glad that I've began to wake up at my normal bright and early time without alarm, and bought myself some time before the rest of the household is up to get something creative going on one of the last days off (school does not begin till Wednesday for my daughter). I've finally got to the blending phase of the perfume idea I got from my trip to San Francisco back in July. The result of which you see in the picture - Honeysuckle & Curry Leaf. It's too early to come into any conclusions here as to where it is heading. It's not necessarily a combination that's going to work out at all. Juxtaposing two elements that weren't even present at the same time and place (proximity and my own experience are the only thing that really tie them together). And those two essences are terribly complex each on its own. Unfortunately, neither really brings up the character of the original raw material all that well either... Which is what's going to be the primary challenge. Honeysuckle absolute is very dense, rich, complex, and while sweet and honeyed in some ways, it has some dirty and not at all as pretty or uplifting as the fresh flowers. It's a little overpowering, with hints of green and dirty and animalic indole. Curry leaf oil is almost revolting. The tincture I made (it was created especially for a custom scent, before I could find the essential oil anywhere) was not all that great either in terms of bringing out the exotic, tingling, green yet spicy and floralcy and bite of fresh curry leaves. Both smell mostly just downright weird but the tincture is more true to the original than the oil, in my humble opinion. 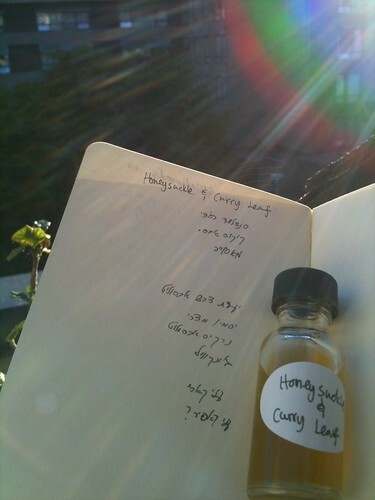 Nevertheless, I came back to the little trial-vial I blended this morning and tried it this evening, with the one conclusion - that there is definitely a honeysuckle presence, and not enough curry. So I added a tad more curry leaf tincture. "Orcas is expertly blended and as a result the natural materials move like water over a stone, seamlessly and fluidly". Trish of ScentHive reviews Orcas - my new natural oceanic fragrance. Leave a comment there with your favourite Ayala Moriel perfume and enter to win an Orcas mini! Can't think of a better way to wrap up this summer (although we have 3 more weeks to go before it's officially fall...). Narcissus, a photo by naruo0720 on Flickr. Growing up in the little village in northern Israel, there was nothing more delightful than spotting narcissus flowers while puddle hopping. We would just follow our noses and find them hiding among thorny bushes with their delicate yolk centre and crisp white petals. But the closer you get - the stinkier, more indolic, animalic and revolting the scent is... Kind of like a narcissistic person - which is charismatic and attractive until you get to know them better and realize how much they stink! The closest thing I smelled in terms of raw materials to living narcissus was a sample of para-cresyl acetate that my friend Laurie Erickson sent me a while back. The absolute, however, smells nothing like it at all, and brings very surprising notes and complexity that makes it a very intriguing raw material, which I would have happily used more often if it wasn't for its extremely prohibitive cost. It also makes me steer clear of the cliches for narcissus (i.e. 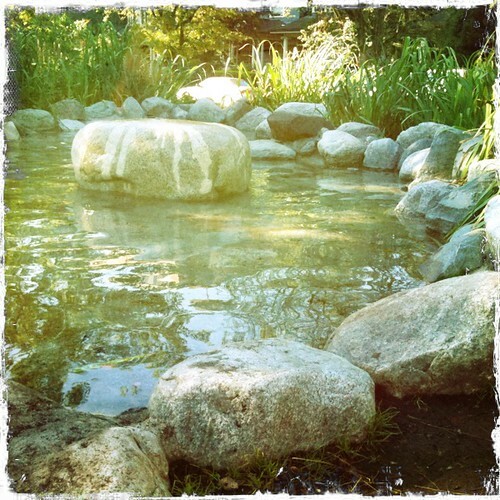 : the young mythical lad staring at himself in the pond until drowning in his own superficial beauty...), and look at it in a new angle, that is more sensory and less cerebral. Opening with surprisingly green, herbaceous notes, narcissus absolute (from Narcissus Poeticus) possesses creamy floralcy reminiscent of tuberose absolute, but layered with far more greenery reminiscent of mint, hay and tomato leaf absolute. There's something dirty and slightly repulsive about it - almost like a heap of rotting garden weeds. The dryout is reminiscent of hay, and is a tad powdery. Still bears a strong resemblance to tomato leaf absolute but softer. In Arctander's words (p. 433): "The odor of narcissus absolute is strongly foliage-green, very sweet-herbaceous over a fainr, but quite persistent floral undertone". Arctander also distinguishes between two varieties of narcissus absolutes that are produced - "des plaines" from the Grasse area, which is "orange-colored, very viscous, and has a floral-sweet, mild and rich, but not very powerful odor"; and the "des montagnes" variety, which comes mainly from Esterel in Southern France and is "greenish-brown, viscous liquid of green and somewhat earthy type. The undertone is sweet and balsamic-spicy, reminiscent of carnation and hyacinth, but still carrying a strong, green-foliage note". It's hard for me to tell which specimen is the sample that I'm holding, as usually the location relates only to country, not exact region or city (and in this case - both varieties are from the south of France). If to guess by the appearance alone of the oil, it could very likely be the "des plaines" as it has an orange colour; but to judge by the smell - it fits the description of the "des montagnes", and is very tenacious. 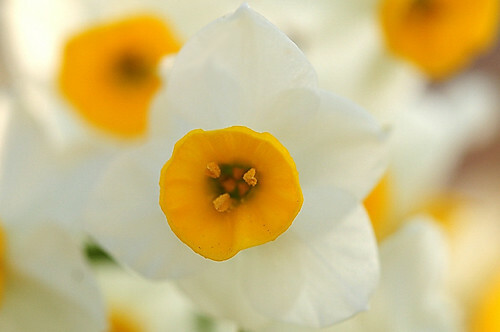 Another type of narcissus is jonquil absolute - a cultivated variety (Narcissus Jonquilla) which is more rare and even more expensive than narcissus, and its scent is sweeter and more floral (tuberose-like) and honeyed with hay and green undertones very similar to that of the narcissus absolute, or as Arctander describes it "... heavy, honeylike, deep-sweet floral odor with a strong green undertone and a somewhat bitter, very tenacious dryout note. The odor bears great similarity to the fragrance of longoza and tuberose, and a remote resemblance to hyacinth". I feel I will need to spend more time with this both of these absolutes to fully grasp their depth and complexities. They are by no means pretty or easy to work with. But that's exactly what I find intriguing and fascinating about them. And I've been deriving immense pleasure blending with them and bringing forward their animalic and floral characteristics while embracing their foliage and earthy aspects. Essences with such complexity and dichotomy unleash my imagination and take me to unexpected places.